Do you attend 4N meetings? Maybe even some of those 'other' business networking events? What do you get from them? Have you even thought about the value of networking outside of the standard ROI (Return On Investment)? Just print it out and fill in the bars in each segment, according to how much that area is serving you. If you're ​a bit more geeky and would prefer to fill in your wheel on screen, you can always download the image and pull it into your favourite photo editing app... if it's one that has enough functionality, of course. I sometimes use Photoshop and select and fill in individual segments, or there are various 'paint' apps that will allow you to simply colour in a layer on top of the image. There's no right or wrong here; sometimes, a bit of good old fashioned colouring in by hand can make the process feel far more 'real' and connected. 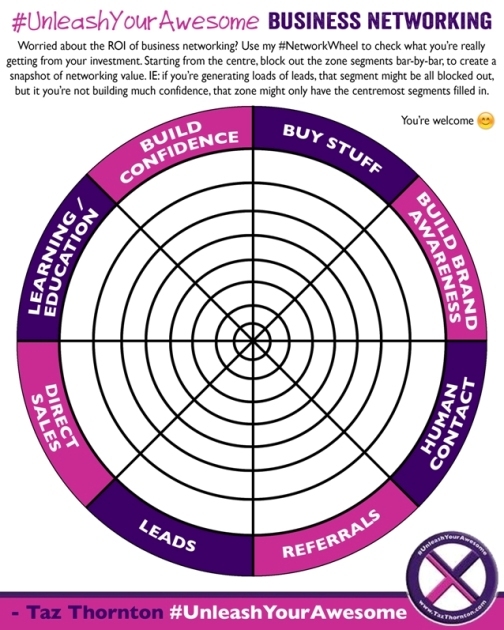 So, for example, if I found I was building loads of confidence from my business networking, that segment might be all blocked out, but if I found referrals were few and far between, I might only block out the innermost bars in that segment. You should end up with an at-a-glance snapshot of where your networking is working for you, and which areas might need a bit more attention. For instance, if you have great brand awareness and referrals/leads/sales are low, you might want to look at your offering, or the way you’re describing your offering. You might even want to ask a couple of trusted fellow networkers for some honest advice and feedback. I love networking. I use my passport and travel all over the country visiting - and 4Sighting at - other groups, as well as my local meets and the group I lead. It’s great for my profile, I learn loads of awesome ‘stuff’ and get to meet some brilliant people. Networking isn’t just about a return on cold, hard, cash (though it’s not that difficult to cover your networking costs if you’ve found the right group, have the right offering and the right attitude) – it’s about brand awareness, confidence building, generating referrals, leads, personal development and education, presenting skills and even buying from other networkers to support your own business. I hope the Network Wheel helps. Let us know how you get on.